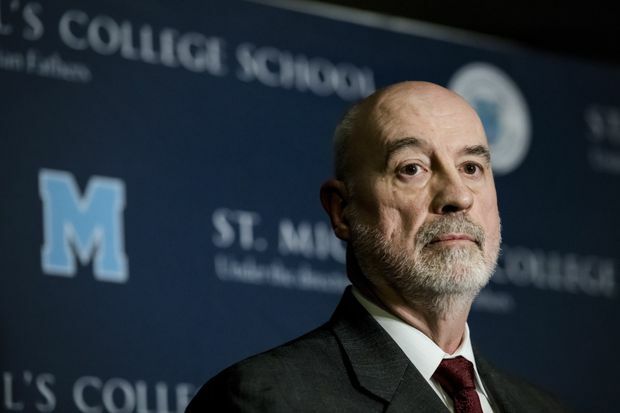 St. Michael's College School principal Gregory Reeves speaks with the media in Toronto on Nov. 19, 2018. A day before the resignations, Mr. Forsayeth said in a press release that Mr. Reeves and Father Thompson were men “of the highest integrity and continue to have our trust,” citing a “standing ovation” the school’s leadership was given at an alumni meeting on Tuesday. "I believe that Father Thompson and Mr. Reeves have their overwhelming support,” Mr. Forsayeth said.